New Employee? Time To Enroll In Our Training Program! To ensure safe onboarding, our Human Resources department created a convenient tool to save time for our clients, while also ensuring employees are certified in their Skills/Knowledge (SK) & Training/Qualifications (TQ). At Clover University, we offer training to all our employees, depending on their job requirements. Every new hire is evaluated by the HSE compliance team to verify SK & TQ credentials. Upon their evaluation, an employee-specific checklist is generated to ensure individuals are prepared to work safely. From there, each employee is required to take their assigned safety courses and complete classes with passing scores. Clover’s Learning Management System, is offered through multiple platforms, online through CloverU and through third party administrators, including Falck Safety Services and Area Wide Safety Councils. Within the tool, we are able to customize training –depending on the employee’s requirements. 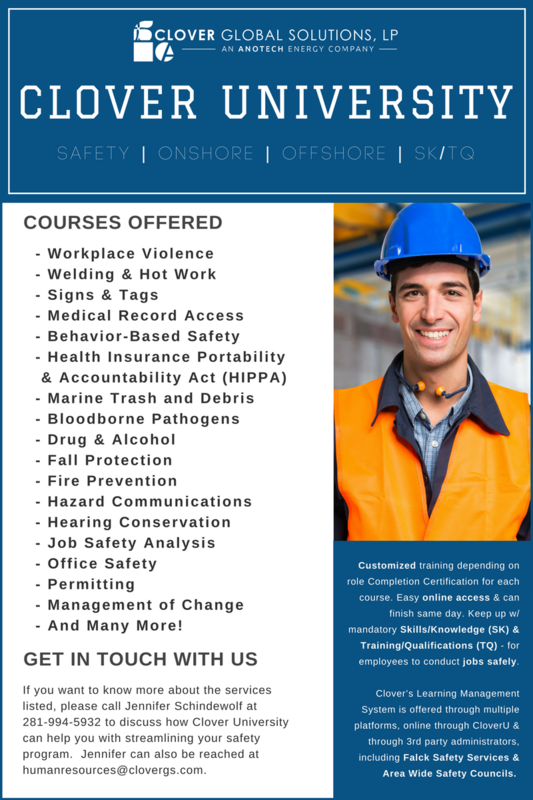 CloverU provides employee access to an ever growing list of trainings necessary to remain compliant in the industrial workplace. If you want to know more about the services listed above, please call Jennifer Schindewolf at 281-994-5932 to discuss how Clover University can help you with streamlining your safety program. Jennifer can also be reached at humanresources@clovergs.com. Clover–Anotech Announces Its Baytown Branch! © Clover Global Solutions and clovergs.wordpress.com, 2013. Unauthorized use and/or duplication of this material without express and written permission from this blog’s author and/or owner is strictly prohibited. Excerpts and links may be used, provided that full and clear credit is given to Clover Global Solutions and clovergs.wordpress.com with appropriate and specific direction to the original content.